Estimated reading time: 5.2 mins. Gamification seems to have been the big thing for a while. Maybe we have heard too much of it. Some would say we have been over sold on gamification, making it the wonder child that will make your websites work and attract and keep customers. Gamification by Design – by Gabe Zichermann and Chris Cunningham is the recommended discussion seed book for UXPerth this month (April 2012). I don’t often review the books for UXPerth, unless they are amazingly outstanding or something a lot worse. This book was published in 2011 so it seems to have been written late 2010. This is a telling factor on some of the examples given in the book, more on that later. As with most titles of this type it is very US centric, which really should have been looked at. It deals with an introduction to gamification techniques, at 170 pages, it’s a quick read, even more so if you skip sections. The book discusses aspects of loyalty generation, motivation both intrinsic and extrinsic, overall game mechanics, engagement and reinforcement techniques. Pretty much all the major techniques are covered off reasonably well. A good quarter of the book is a developmental tutorial involving step wise (using ruby) code examples of gamification. Which I didn’t find to be that useful at all. The final chapter is nothing more than a sponsored insert, like those brought “sponsor” talks at conferences, this was a waste of space. Plus it dealt with badges, which are the worst aspect of gamiification. 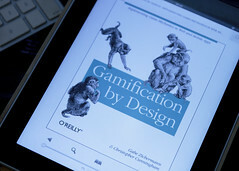 When you read this book you aren’t really sure if you are reading a book on gamification or game design. So many times the examples quoted where just pure games, games that people would use as distractors or time fillers rather than example of commercial sites or applications using the same techniques for commercial gain. The case studies that I was hoping to be a core aspect of the book, seemed to be too brief or in several cases dated very quickly; such as Yahoo Answers or Quora. However the examples dating is often an issue with light weight tech books. Maybe this is a US thing, but Yahoo Answers have never been relevant here. It just seemed overloaded with bad information, even years ago. Quora well that’s really slid into a place of all noise no information in the last year. Also some case studies I have never heard of.. like Health Month, again I’ll assume it’s a US thing like Starbucks or the like. A good deal of the time a found myself wanting to see the research, or the data at least, behind the bold statements on behaviour on this or that technique, now I’m sure Zichermann has them, but why aren’t they in the book. After a while it just became a very frustrating read. In fact if I hadn’t been using an ebook version I know I would have thrown this book across the room a good number of times. As a UX consultant I read lot, and frankly this book although technically good, just lacked supporting documentation. I would have normally discarded this book into the reject pile within the first few chapters. Maybe I’m not the best person to review this book. I’m not a current gamer. I used to be, then I discovered life is too precious to be wasted on mindless addictive games that don’t get you anywhere. So when the authors talk about engaging people, about hooking them in with leader boards, achievements or other methods, I understand the concept, but just don’t get as to why people would be sucked in. Sure I understand the techniques, but on a personal level what’s not to stop the person returning to the real world and abandoning this silly internal quest an app or site has set for them. Maybe I need to see this happening with real people with some user testing. There really has to be something in it for the user beyond stupid badges – yes I do mean Four Square – another poster child in this book. A good deal of the good assumes it know why the techniques are working, but doesn’t show any details. Then there is also a the ethics of all this tobe considered, with addictive gamification hooking a user into a almost gambling like habit isn’t really that ethical. Its nice the way this book neatly sidesteps the issue. Not even referring to ethical aspect left a bitter taste in my mouth. Being aware of ethical of nay UX manipulation of an audience is something any UX professional needs to be aware of. Anything in the UX world that is a design pattern or now standard technique for engagement or audience retention has it seems has suddenly become a gamification aspect. For example from forum post ranking to star rating to summary control panels these are all now gamification. Years ago in 2000 they were called community engagement. Now I have followed, seen, used and designed lots of these techniques as they have developed over the years, I can tell you they didn’t appear suddenly from the world of games design. There seems to be an over zealous desire to label everything as being from “game design” in this book. If you are a developer or designer is this book any good? Well yes and no. It’s a good introduction text in relation to the techniques and what behavioural effects they are meant to have. But I would take the examples with a grain of salt. As a UX consultant I could have lost half the book without noticing. It’s not a badly written book. It does show you the techniques and methods used in gamification, for that I’ve given it 3 stars. If you just want the core information, then yes this book does supply that. Some say it’s the number one book in gamification, this isn’t my view. I have this feeling throughout the book maybe the editor should have been a little more questioning of the references than the code. If you do buy this book, please go get the cheaper ebook. Save yourself some money.